First published Canberra Times 21 March 2012. Well, I’ve finally faced the inevitable, my tomatoes are awash and have split on the vine. It’s distressing to see the huge red and green heritage varieties, hanging forlorn and broken, spewing seeds from their injuries. I turn my attention to my burgeoning, but painfully slow growing eggplant that produces two perfectly purple globes, precisely timed to feature my current lentil mania. 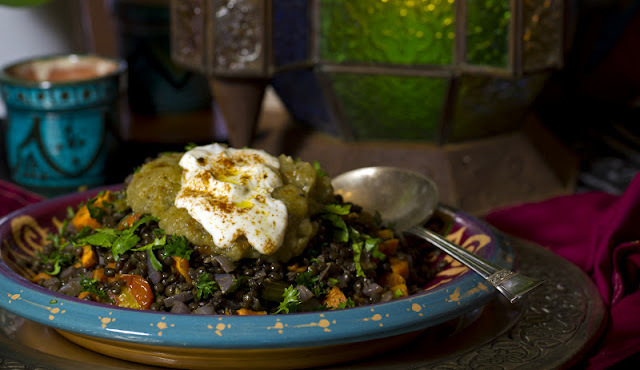 This is a bright and interesting dish and the eggplants provide a lovely smoky, musky flavour to the traditionally cooked lentils. 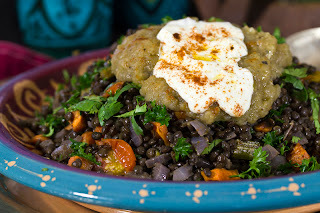 I decide to go organic with the rest of the ingredients to complement my organic eggplants, including the lentils. This dish doesn’t stretch your time or budget and is a healthy midweek meal, suitable for those on vegan, gluten free or general weight loss diets. If you make extra, it’s also a good one to take to work and reheat for lunch. A useful tip – if you are using the oven griller technique to roast the eggplants, ensure that you pierce them a few times before cooking them, as this allows the moisture to escape. Otherwise you may end up with an eggplant explosion. To cook the eggplants on a gas stovetop, which is the most effective way, start by lining the area around the burners with foil to protect them. Put the eggplants directly on to the moderate flames and roast for 12 to 15 minutes, turning frequently with metal tongs, until the flesh is soft and smoky and the skin is burnt all over. Keep an eye on them the whole time so they don’t catch fire. You may need to turn on your exhaust fan. Alternatively, this could be done over a burner on a barbeque. For an electric stove, pierce the eggplants with a sharp knife in a few places and place them on a foil-lined tray directly under a hot griller for one hour, turning them a few times. The eggplants need to deflate completely and their skin should burn and break. Remove the eggplants from the heat. Pre heat the oven to 140°C. Cut a slit down the center of the eggplants and scoop out the flesh into a colander, discarding the black skin. Leave to drain for at least 15 minutes, and transfer the contents to a bowl. Add the crushed garlic, season with plenty of salt and pepper, 1½ tablespoons of the red wine vinegar and a splash of olive oil. Puree with a stick blender or mash with a potato masher until the eggplant is a coarse consistency. While the eggplants are grilling, place the lentils in a medium saucepan. Cut one carrot and half a celery stalk into large chunks and throw them in. Add the bay leaf, thyme, onion and cumin and cover with plenty of water and bring to the boil. Simmer on a low heat for up to 25 minutes, or until the lentils are tender, skimming away the froth from the surface from time to time. Drain in a sieve. Remove and discard the carrot, celery, bay leaf, thyme and onion and transfer the lentils to a mixing bowl. Add the rest of the vinegar, 2 tablespoons of the olive oil and plenty of salt and pepper; stir and set aside somewhere warm. Cut the remaining carrot and celery into 1cm dice and mix with the tomatoes, the remaining oil, sugar and some salt. Spread in an ovenproof dish and cook in the oven for about 20 minutes, or until the carrot is tender but still firm. Add the cooked vegetables to the warm lentils, followed by the chopped herbs and stir gently. Add the remaining vinegar, olive oil, taste and adjust the seasoning. Spoon the lentils onto serving plates. Pile some eggplant in the center of each portion and top it with a dollop of yoghurt and a sprinkle of paprika. Finish with a trickle of oil. It’s one of those weeks when work is busier than usual, kids and extended family require attention and even the family dog decides to add to the chaos and needs an emergency trip to the vet. This new year flurry always hits and I’m never prepared for the round of birthdays that seem to appear without notice at this time of year. With a crowd appearing in a few hours time for a birthday celebration, I have dips and crackers sorted, the main dish is seafood; easy and under control, but dessert is elusive today. The pantry still has a lingering bag of Amaretti biscuits left over from a Christmas visitor, which, combined with my fruit bowl of oranges and lemons, inspires an Italian theme. I am an absolute sucker for lemon and orange curd, so set out to make the curd first so it can go straight into the freezer to cool, ready to assemble the dessert. Ideally, this dessert should be made a few hours in advance to allow the flavours of the ingredients to infuse. I used a few tablespoons of Grand Marnier in this, although you could also use Limoncello or any citrus flavoured liqueur you have in the cupboard. Find some pretty glasses to serve it in , so the layers are visible and you have a very easy, but impressive dessert to serve guests. Make the citrus curd first to ensure it is fully cooled before assembling the dessert. Place the citrus juice and butter in a saucepan over low heat and stir until the butter is melted. Mix the sugar, egg and egg yolks together in a small bowl or jug and slowly drizzle into the saucepan of butter and juice, whisking continually to avoid the egg from curdling. Keeping the pan over a low to medium heat, stir constantly until the mixture thickens. Set aside to cool, or force the cooling by placing in the freezer for 15 minutes. To make the parfait, place the cream, icing sugar and liqueur in a bowl and whisk until soft creamy peaks form. Stir the cooled citrus curd to remove the skin that may have formed on the top. Spoon half of the citrus curd into four glasses and spoon half of the flavoured cream on top of that to form 2 layers. Top each with the crushed Amaretti biscuits, then spoon over the remaining cream to form a top layer. 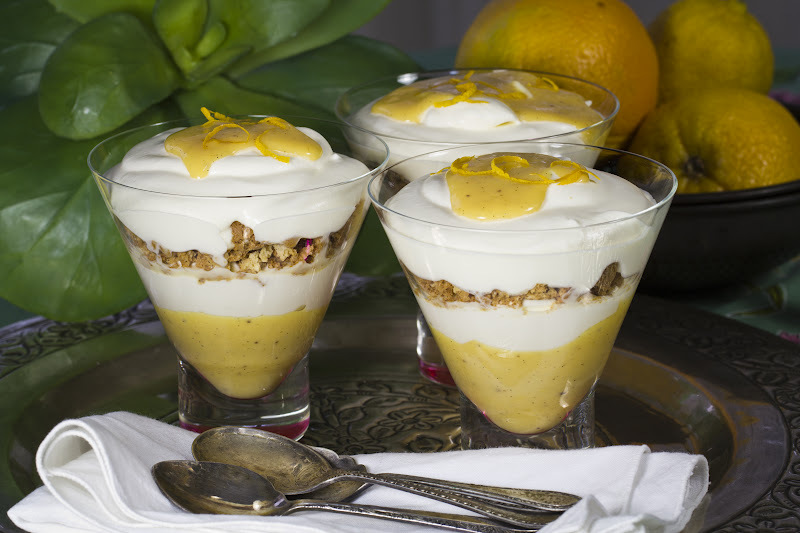 Drizzle a teaspoon of citrus curd over the top and decorate with toasted almonds or orange zest. Refrigerate for a couple of hours before serving.